My Kombucha-loving sister came to town this weekend, and per the usual, we drink kombucha and watch the weirdest movies on Netflix. It’s tradition! To celebrate her sunny personality, her hatred for plastic water bottles and love for white pizza, I have created a cocktail that perfectly describes her. We both love Kombucha, and lately I’ve been too lazy to try making a shrub, but I wanted something vinegary and tart in my cocktails. So why not just use Kombucha? Normally, I drink Kombucha as an alcohol substitute. It’s perfectly fizzy and something special to drink on nights when I’m craving a cocktail. But it’s also great for mixing into a drink! It’s naturally fermented and carbonated, and it comes in all kinds of flavors. 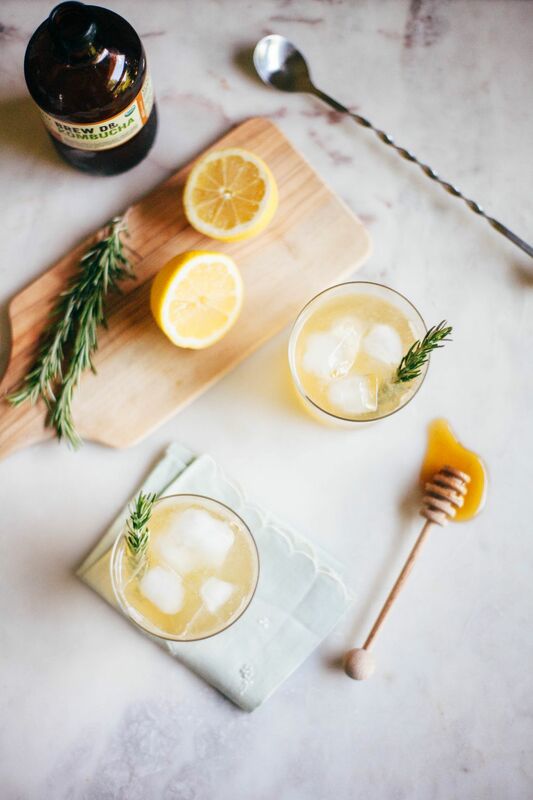 My personal favorites are usually cayenne or ginger, so I’ve come up with a gingery version of a honeybee! 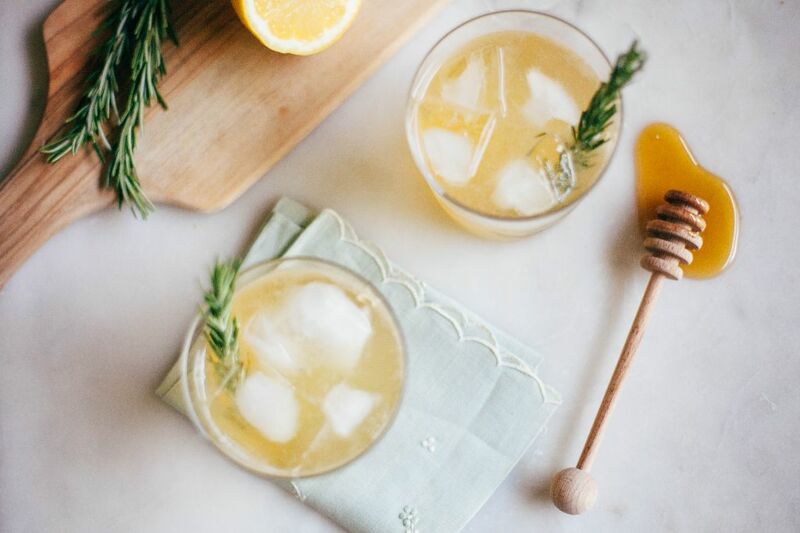 Complete with rosemary, ginger kombucha, lemon, and honey. 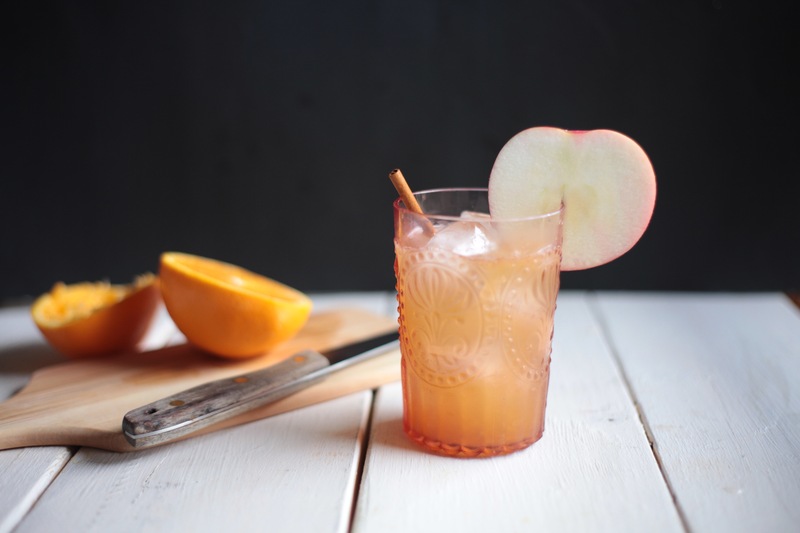 It’s the perfect summery drink. And you could even make pitchers of it, if you’re feeling adventurous. Here’s how to make it. My recipe makes two drinks at once, so halve it if you’re just making one cocktail. 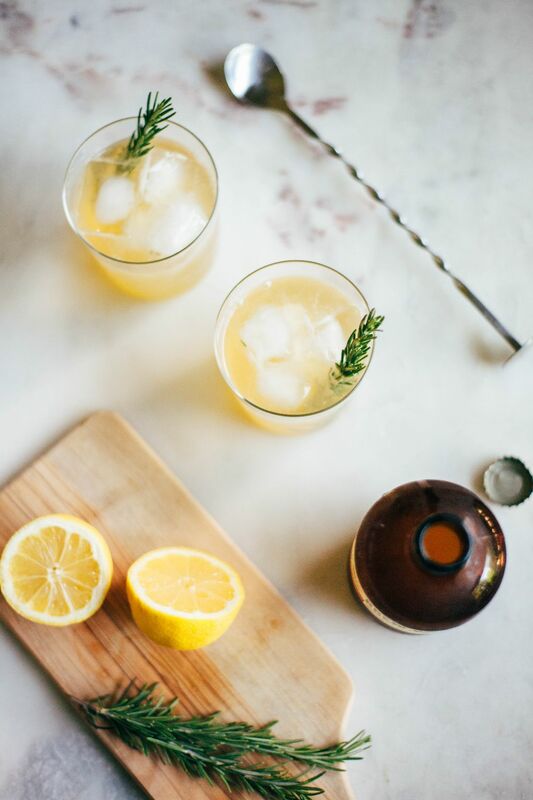 I started with a cocktail shaker and poured in my lemon, rosemary leaves and tequila. You can use vodka or tequila–both are excellent. Then muddle the leaves with a muddler or a wooden spoon. Add the honey, and stir in well with a spoon. I did all of this without ice, because honey tends to seize when it gets cold, and it won’t mix in as well. Then get two short tumblers, fill it with ice. Pour half of the mixture in each tumbler. Then top each off with ginger kombucha. I used Brew Dr. Lemon Cayenne Ginger, or I also love GT’s Gingerade. Both are excellent. Then give it a quick stir and garnish with a pretty rosemary sprig. Voila! What’s your favorite cocktail? Do you like using a shrub? 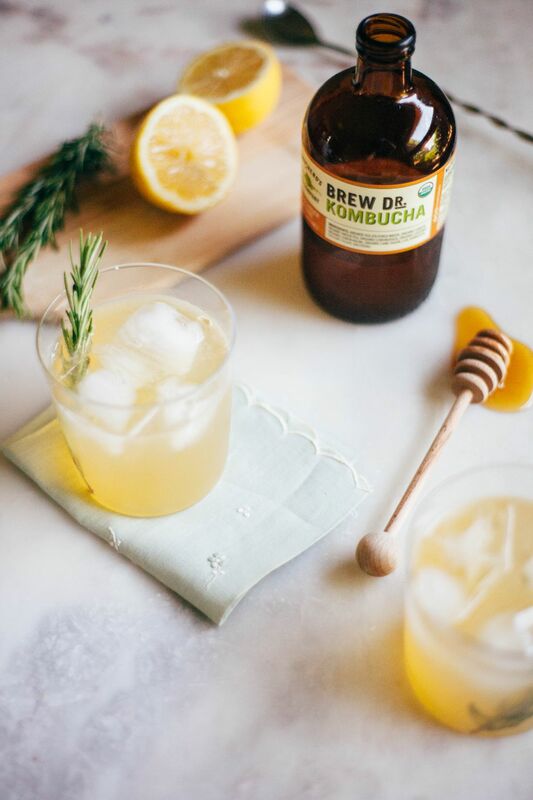 Have you ever tried a kombucha cocktail? 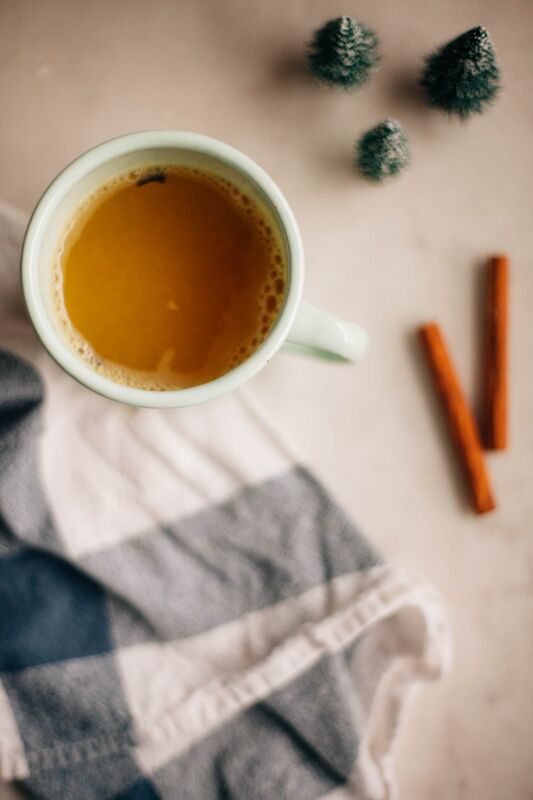 See the full recipe below and let me know what you think! 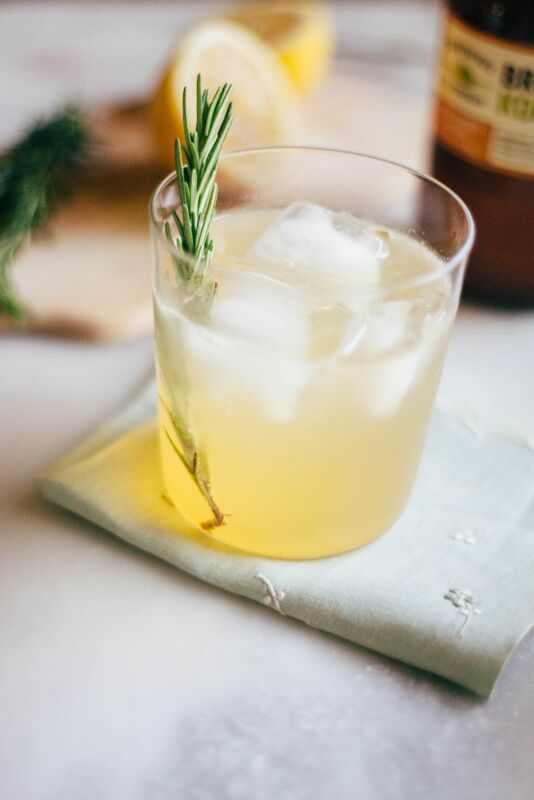 In a cocktail shaker or a glass with a strainer, add the lemon, rosemary leaves, tequila or vodka, and muddle together, crushing the leaves. Add the honey and stir together. Fill a short tumbler with ice and strain the lemon mixture into the glass. Top with ginger kombucha until glass is almost full. Add the rosemary sprig to garnish. 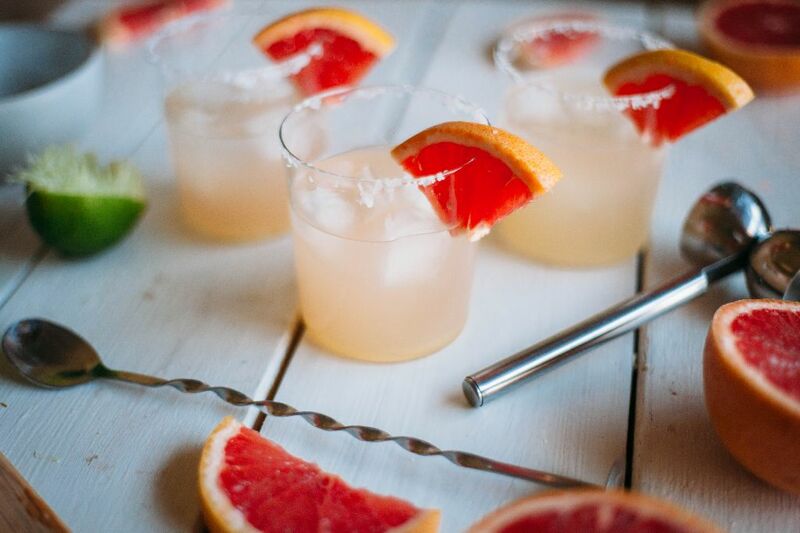 When in Florida, make margaritas. That’s my mantra. This recipe was made famous when visiting my in-laws in Florida, who are definitely my biggest fans. We could probably singlehandedly cause a lime shortage on our visits with the amount of margaritas we make. But this recipe is a bit easier. 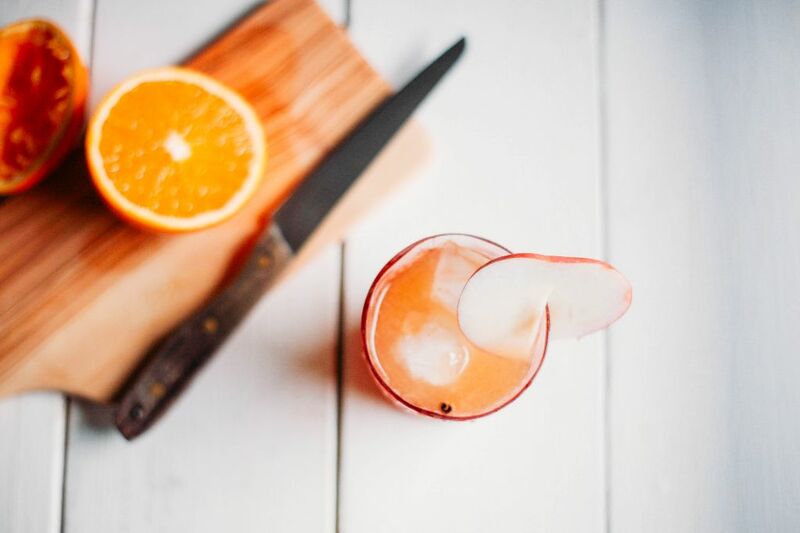 You can buy fresh-squeezed grapefruit juice at the grocery and save your hands and some limes. Only one lime per drink is required for this recipe.